Who says you can’t have it all? 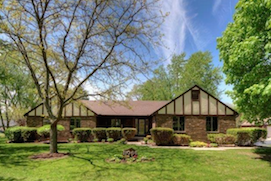 This recently updated home is situated on over an acre of manicured grounds. Imagine your own oasis including mature trees, koi pond, organic and perennial gardens and a green house! 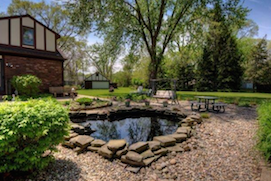 With frontage on beautiful Hamburg Lake you will find true peace. Hamburg lake is an 88 acre private lake with no motors. Inside is a delight as well. With an open kitchen that features a breakfast bar, Hardwood floors and plenty of counter top space and cabinet storage. The family room with a brick fireplace is adjacent to the kitchen and will become the gathering spot for all activities. The light filled living room is just beyond, with access to the multi-level deck. This home also includes a formal dining room, for more intimate events. The bay window adds interest and provides a lovely view. A sunroom with views of the lake adds to the charm of this original owner home that is surrounded by nature. With a total of three bedrooms, there is plenty of room for all. The master suite is large and inviting, and includes a walk-in closet and tiled master bath. The other two bedrooms are ample in size and afford options like a guest room, home office or craft space. The lower level is finished for extra square footage, for living or storage. This home has plenty of garage space, attached and detached, for all your lake toys! The setting of this home invites you to enjoy the beauty and serenity of lake living. Extra build-able lot available for sale. This is a perfect piece of Ann Arbor area real estate! Book a showing today!